Harley-Davidson® Factory Flat Track Racing Team riders Brandon Robinson and Kenny Coolbeth Jr. cracked the American Flat Track (AFT) Twins top 10 at the Harley-Davidson Black Hills Half-Mile at the Black Hills Speedway, the second AFT event in two days held during the 77th Annual Sturgis Motorcycle Rally. Racing on a track that grew faster but slicker as the sun went down, Robinson qualified his Factory Harley-Davidson XG750R competition motorcycle 15th for the 25-lap main and charged up to 11th place before the race was stopped on lap 13 for oil on the track. Robinson battled through the pack up to seventh place in the closing laps with Coolbeth on another Factory XG750R motorcycle right on his back wheel in eighth place at the finish. The result was the eighth top-10 finish in 13 races this season for Robinson. 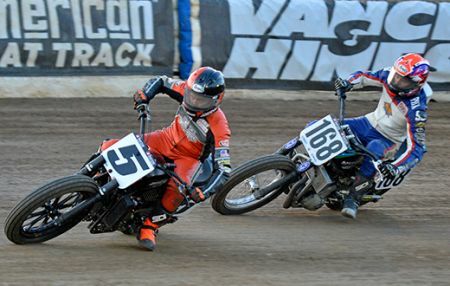 Harley-Davidson® Factory Flat Track Racing Team rider Jake Johnson also put his XG750R motorcycle in the main at Black Hills Speedway but was forced out with a mechanical issue after nine laps. The Harley-Davidson XG750R flat tracker is a competition motorcycle powered by a race-modified, liquid-cooled, fuel-injected Revolution X™ V-Twin engine originally engineered for the Harley-Davidson Street® 750. The XG750R flat tracker motorcycle is not a production model. The Revolution X V-Twin engine is for sale through Harley-Davidson dealers today and can be modified for racing use by aspiring dealers and privateers. After 13 of 18 races on the 2017 AFT Twins schedule, Robinson is in seventh place with 98 points. Coolbeth is in 11th place with 75 points, and Johnson is 13th with 70 points. Harley-Davidson® Factory Flat Track Racing Team will be back in action on August 13 at the Peoria TT at the Peoria Motorcycle Club track in Peoria, Ill. The Harley-Davidson Factory Flat Track Racing Team is proudly partnered with Vance & Hines Motorsports.